From Middle English sewer, seuer, from Anglo-Norman sewere (“water-course”), from Old French sewiere (“overflow channel for a fishpond”), from Vulgar Latin *exaquāria (“drain for carrying water off”), from Latin ex (“out of, from”) + aquāria (“of または pertaining to waters”). 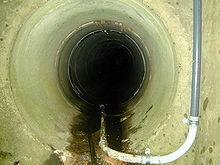 A pipe or system of pipes used to remove human waste and to provide drainage. (transitive) To provide (a place) with a system of sewers. From Middle English seware, seuere, from Anglo-Norman asseour, from Old French asseoir (“find a seat for”), from Latin assidēre, present active participle of assideō (“attend to”), from ad (“to, towards, at”) + sedeō (“sit”). (now historical) A servant attending at a meal who is responsible for seating arrangements, serving dishes, etc. While the Saxon was plunged in these painful reflections, the door of their prison opened, and gave entrance to a sewer, holding his white rod of office. His nephew Charles, meanwhile, had grown up in the royal household, working as a sewer, or waiter. A small tortricid moth, the larva of which sews together the edges of a leaf using silk.